Written by Felipe Azenha & filed in Events, Mixed-Use, Urbanism. Miami 21 was a great leap forward in urban zoning for Miami and for the world. At the time it became law, its greatest attribute was reduced complexity — basically four zoning districts and almost no overlays or special exceptions — and thus increased predictability for both residents and developers. But no document so large is without its glitches, and Miami 21 was intended to be constantly refined. 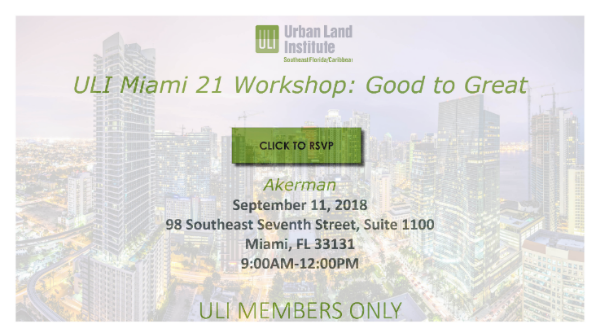 ULI will bring together experts to discuss and prioritize fixes to Miami 21 that incorporate new best practices, address new challenges, and remove obstacles to the city we want to become. Click here to see a list of attendees.